Massachusetts Sen. Elizabeth Warren was in New Hampshire on Saturday to campaign on behalf of Democratic presidential nominee Hillary Clinton and New Hampshire Governor Maggie Hassan. Warren, a favorite among progressive Democrats, attended three events, first stopping at Clinton campaign offices in Nashua and Manchester before attending an event at the University of New Hampshire in Durham with Hassan. "We believe that government should not be run only by those at the top and we need to get money out of politics overturn citizens United and return this democracy to the American people," Warren said. 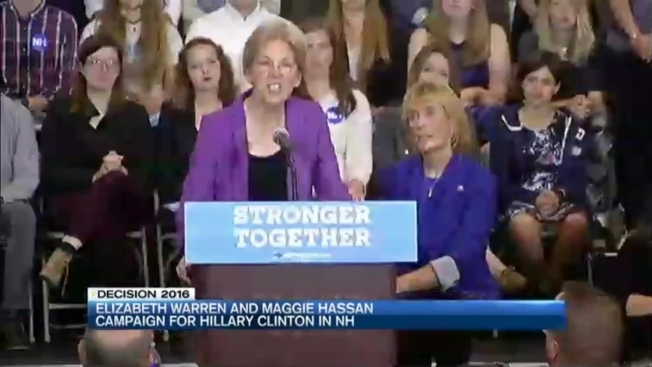 Similar words were echoed by Hassan, who is looking to join Warren in the U.S. Senate. "We need you to get out the vote and to get your friend and families and neighbors to do the same," Hassan said. Both Democrats took shot after shot at Donald Trump, Warren calling him, "a selfish low life who will never be president of the United States." Warren went on to discuss Clinton's economic plans and what she sees as the dangers of a Donald Trump presidency. Warren, a chief critic of Wall Street, is a key surrogate as Clinton works to win over supporters of Vermont Sen. Bernie Sanders. There were no Trump supporters protesting outside the event, but instead a group of Jill Stein supporters who wanted to express their opinions. "It's shameful we are so solidly a two party system that even when we have two un-electable horrible corrupt un-electable candidates we can't even get a viable third party," said Paula Iasella, of Wilton, New Hampshire. Clinton and Trump will face off Monday night in the Democratic Party's first presidential debate.